From hiking to the top of a mountain together to boating with their pups then pitching a tent and roasting s’mores– every moment of this extended engagement session was an adventure! Dana and Joel reached out to me after checking out Fearless Photographers in search of an international award-winning wedding photographer in their area. 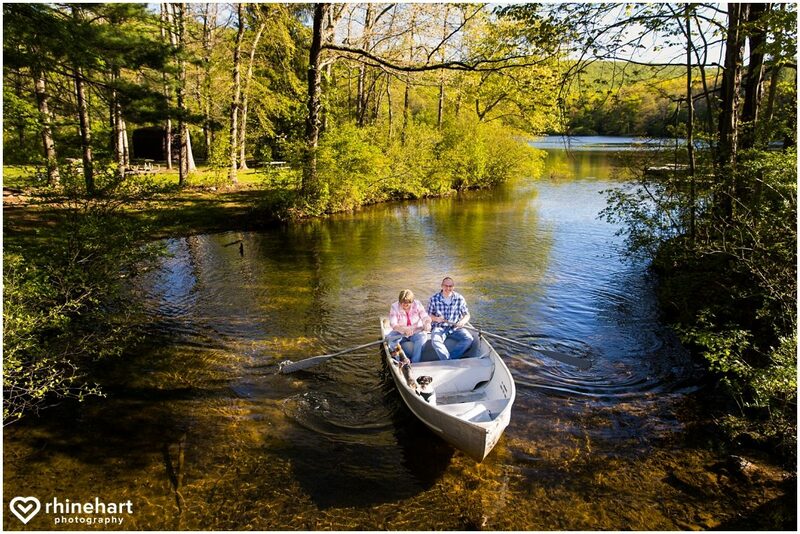 Dana and Joel began their session in a rowboat. It wasn’t what we had planned, but Joel, who tends to be the spontaneous type, noticed the boat rental. I loved the idea and so did Dana and Joel’s dogs, Peanut & Fluff. Dana, who tends to be the super organized type, actually had doggie life jackets along and was game, too! 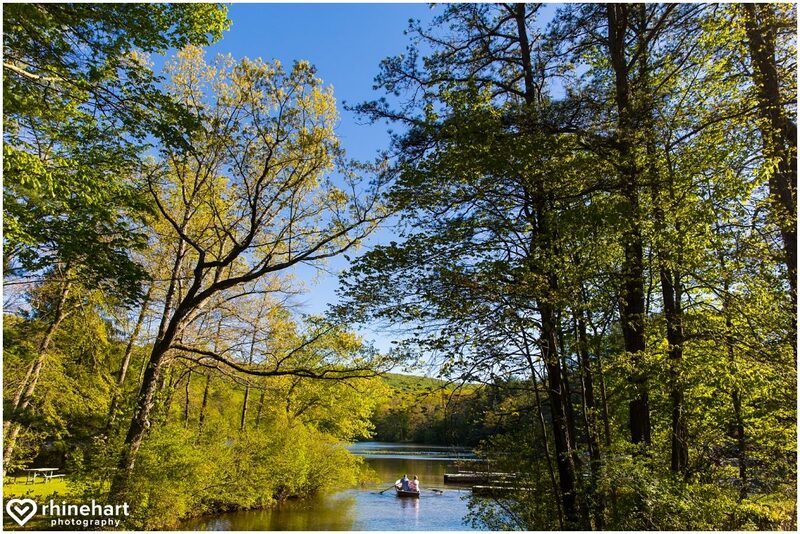 The act of rowing the boat itself spoke volumes about their relationship and personalities! Joel dove right in with rowing, but wasn’t exactly sure how to do it and began rowing the boat backwards! Dana tried to explain, but ended up “taking the reins” rowing the boat “properly” which Joel found both annoying and slightly amusing. After a minute or two they were rowing in sync, laughing and enjoying the water with their dogs. And of course a more classic portrait of Dana & Joel as well. I used a shallow depth of field to allow the forest (and a trail blaze) to be in the background, and allowed leaves to cross into the foreground to add some visual interest. Dana’s maid of honor was awesome and came along on the trip, watching the pups as Dana Joel and I hiked to the top of a mountain and manning the fire and tent (yesssss those pics are coming up soon and so much fun)! 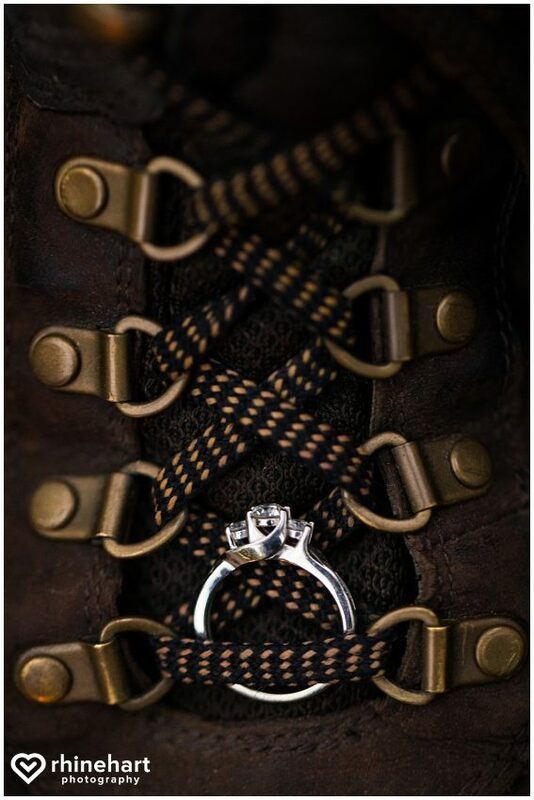 Dana said that the Appalachian Trail passes through not only their engagement location, but their wedding venue as well. I asked if she could circle the location on the map using her ring– here it is! Throughout our time together, I noticed how well-matched Dana and Joel are– there was a lot of laughter, team work, thoughtfulness and trust. This has to be one of my favorite photographs from their session as it really shows Dana and Joel in their element, having a blast! Wow!!! What a view!!! Hold on tight, guys!!! They headed to the campsite… They shared that one of their life goals is to visit every national park in the USA! I love a challenge and photographing a couple in the woods in the dark is just that! Dana and Joel, I absolutely loved working with the two of you!!! I’m so glad that you decided to book the time to go on so many adventures together during the session– from the boat with pups, to the hike, to the view and campsite and fire… I loved every minute :). I am eagerly anticipating photographing your upcoming wedding at Crystal Springs Resort!